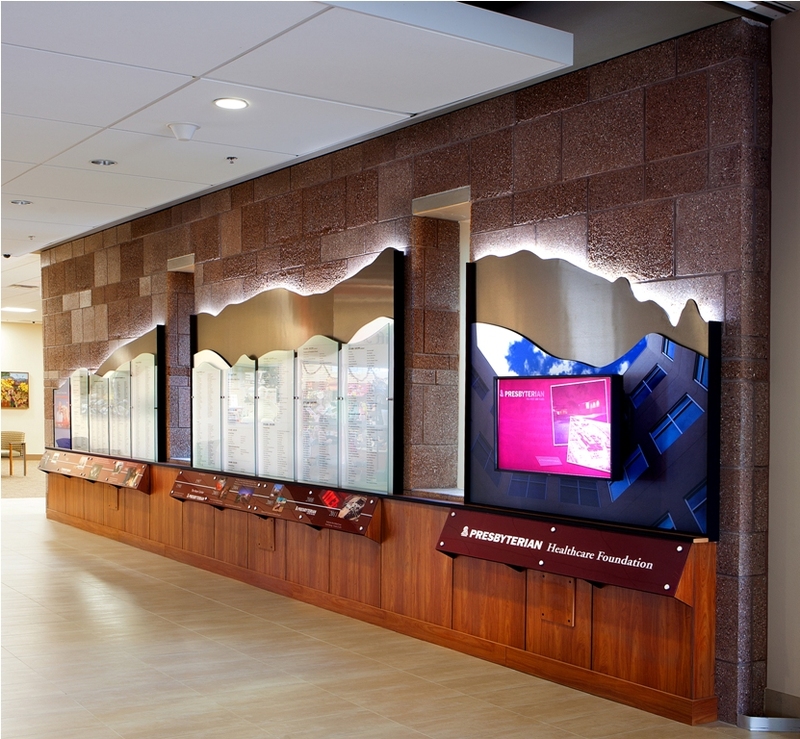 Presbyterian Healthcare Services of Albuquerque, New Mexico, furthered its reputation for providing advanced medical care with the recent opening of its dynamic new Rust Medical Center facility – and the unveiling of a dramatic recognition display, designed, fabricated and installed by Planned Legacy. 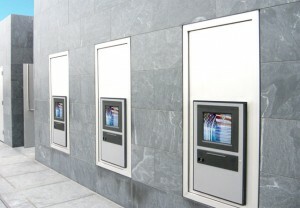 The integrated display, incorporating a 40” LCD monitor with interactive multimedia presentation, highlights materials and finishes that complement the hospital’s contemporary décor while employing elements such as brushed bronze and silver laminates along with anodized aluminum to create striking accents. Overall, the display is 32’ wide x 8’ high but extends barely 12” from the wall, requiring unique supports because of the existing architectural masonry and windows. Finally, as with other projects Planned Legacy has created for Presbyterian, the display is shaped to emulate the nearby Sandia Mountains, visible right through the integrated windows. The overall look and feel is engaging and inspiring and, based on comments from visitors, the display is a worthy testament to the many donors and supporters who made the new facility a reality. 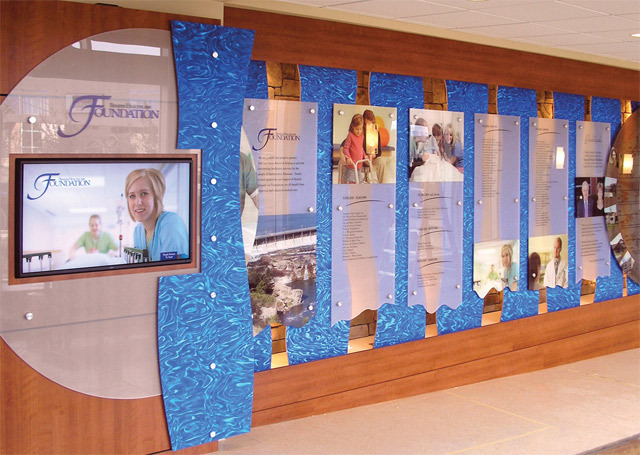 For more information on the Presbyterian Rust Medical Center donor recognition display, or to discover what Planned Legacy interactive donor walls, recognition displays and capital campaign promotion systems can do for your organization, please call Planned Legacy Toll Free at 1. 866.882.3580 or e-mail solutions@plannedlegacy.com. Need additional inspiration or more ideas for your new donor wall or donor recognition project? Check out the donor wall photos in our donor recognition gallery. Officially opened in October 2006, the United States Air Force Memorial is located just outside the Nation’s capital in Arlington, Virginia. A national place of pride, reverence and remembrance, the Air Force Memorial celebrates the history and valor of the Men and Women of the United States Air Force and its Heritage Organizations. An integral part of this breathtaking monument is the interactive touch-screen array designed and installed by Planned Legacy. Visitors can use one of three outdoor interactive LCD displays to view names and profiles of Air Force veterans, lists of Memorial Charter Members and photos, and a narrative of Air Force history. Visitors can also use an attached credit card swipe to make spontaneous contributions electronically to the Memorial association. Central to the design of the Air Force Memorial, which was created by James Ingo Freed, one of America’s finest architects, are three stainless steel spires that soar skyward, the highest of which ascends 270′ above the 3-acre elevated promontory site. The three spires represent the core values of the Air Force – integrity first, service before self, and excellence in all that is done – and the Air Force’s total force – active, guard and reserve. Other elements of the Memorial include a bronze Honor Guard (representing all the people of the Air Force), inscription walls and an open glass wall of remembrance, all on a landscaped memorial park and parade ground overlooking the nation’s capital. 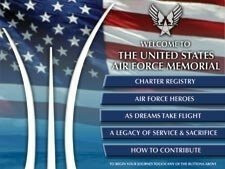 For more information on the United States Air Force Memorial and to discover what Planned Legacy interactive donor walls, recognition displays and capital campaign promotion systems can do for your organization, please call Planned Legacy Toll Free at 1.866.882.3580 or e-mail solutions@plannedlegacy.com. Need additional inspiration or more ideas for your new donor wall or donor recognition project? Check out our donor recognition photo gallery. The University of Vermont (UVM) had several goals in mind when it decided to build a new student center. They wanted a new and exciting architectural “face” for the campus; a community-crossroads where students and faculty could gather in a dynamic, inspiring space; and a display that would represent UVM’s core values – environmental stewardship, equity, social justice and academic excellence. When it came time to give thanks to those who made the Dudley H. Davis Student Center possible, maintaining those values was crucial. UVM wanted an architectural installation that was both timely and timeless – reflective of University’s long history and enlightened future. About UVM – With sections including President’s Welcome, Two Centuries of Excellence – a moving University timeline, Fast Facts and UVM in the News. If Not For You: Donor Recognition – A searchable database of contributors to the University’s recently completed comprehensive campaign, and a How to Give section for those who would like to make future contributions. To Make a Difference: UVM People – A video archive of outstanding UVM students and a section to nominate additional students. FYI @ UVM – A current and future events calendar. 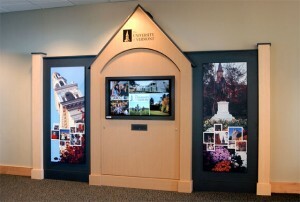 To view an electronic demonstration of the UVM Integrated Donor wall, or for more information and to discover what Planned Legacy interactive donor walls, recognition displays and capital campaign promotion systems can do for your organization, please call Planned Legacy Toll Free at 1.866.882.3580 or e-mail solutions@plannedlegacy.com. Episcopal High School of Alexandria, VA, has a long and storied athletic heritage, extending back over 100 years. To commemorate the School’s sports legacy Episcopal created an architectural Hall of Fame display to honor individual and team athletic achievements in a dynamic and engaging format. 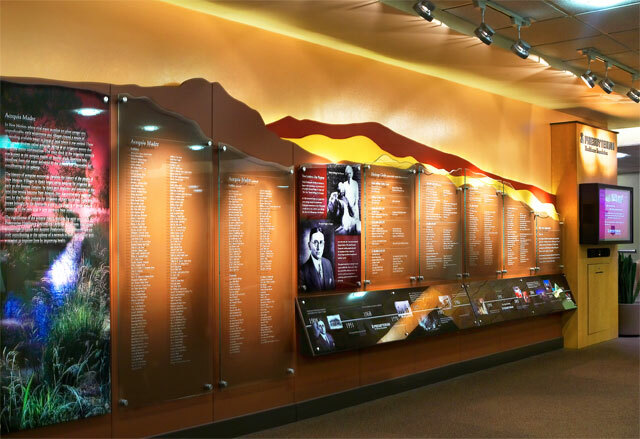 The highlight of this Hall of Fame display is an easy-to-navigate, informative and interactive multimedia presentation designed and programmed by Planned Legacy. Visitors to the display have a wealth of information, photographs and statistics available at their fingertips. Beginning with the Hall of Fame module itself, choosing this button generates a listing of Hall of Fame inductees sorted by the respective individual’s Class Year as well as Year of Induction. A special icon also indicates whether the individual was inducted posthumously. Visitors can also choose to search by Name. Doing so produces a virtual keyboard where inputting up to three letters of a last name generates an alphabetical listing of entries along with their respective Class Year and a personal profile. The profile shows a photo of the team(s) that person was on. When the team photo is touched, a listing of team members and any Hall of Fame inductees on the team are displayed Another interactive button enlarges the team photo. When the Year button is pushed, a virtual keyboard appears into which visitors input a specific year, in turn generating a listing of that year’s teams along with a team profile, which includes team members and any Hall of Fame inductees. Finally, choosing the Sport button produces a grid with all the Episcopal sports teams listed. Selecting a team generates an interactive listing of each team, its year and a team profile, along with Hall of Fame inductees for that year. The multimedia presentation is informative, exciting and involving and helps Episcopal High School celebrate its champions. 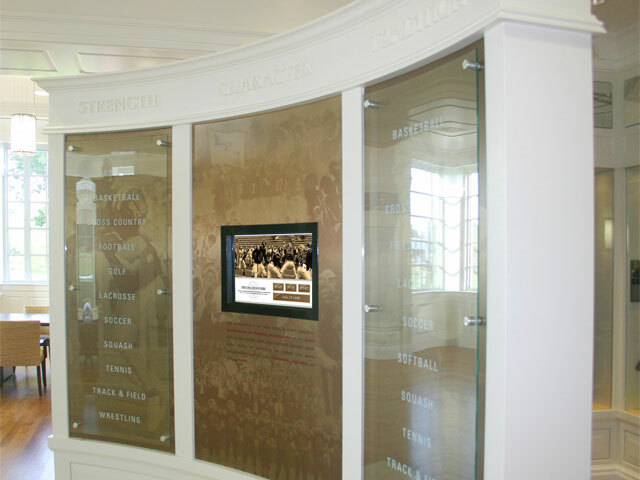 For more detailed information on Hall of Fame Displays and the at Episcopal High School project in particular, please call Planned Legacy Toll Free at 1.866.882.3580 or e-mail solutions@plannedlegacy.com. Nonprofits are often hit hard during shaky economic times and reduced budgets can make it difficult to maintain donor loyalty. 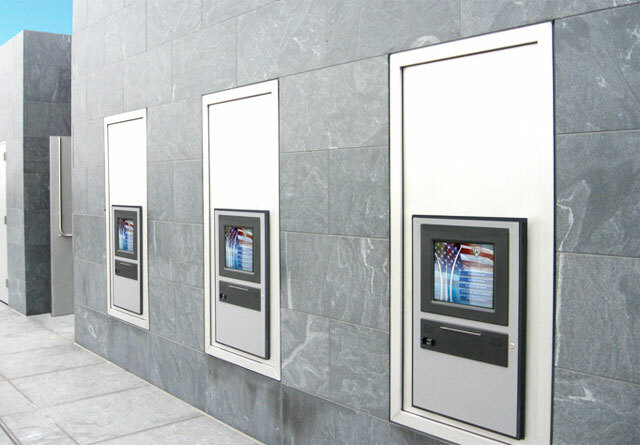 One of the most economical and effective ways to ensure donor loyalty is through the utilization of multimedia presentations integrated into donor walls, recognition displays, touch-screen kiosks and/or on digital signage. Vibrant multimedia presentations can emphatically show your donors how much you truly value them, while also saving you time, money and space in the process of attracting new donors, through modules that include enhanced donor recognition, donor profiles, testimonials, volunteer recognition, government and corporate recognition, leader profiles, Board member profiles, current and future projects, historical video and stories about your organization. Multimedia presentations have a distinct advantage over static donor walls, signage and displays, in that their colorful ever-changing nature never fails to attract. But while multimedia presentations can stand alone, they can also be integrated into classic architectural donor walls and recognition displays to take advantage of the best features of both. The proven presence of a traditional, tried and true static donor wall, when combined with multimedia messaging, has no peer when it comes to donor attraction and donor recognition capabilities. Additionally, because the multimedia content is digital, space is virtually unlimited and updates can be made instantly and quickly from the comfort of your office. Never again will you lack the time or space needed to create awareness and get your message out in a timely fashion. Multimedia presentations can help your organization attract, inform, inspire and motivate current and future donors to enthusiastically embrace and share your latest fundraising projects, while persuasively capturing the culture and vision of your organization. The end result is “deep” donor participation and increased loyalty. 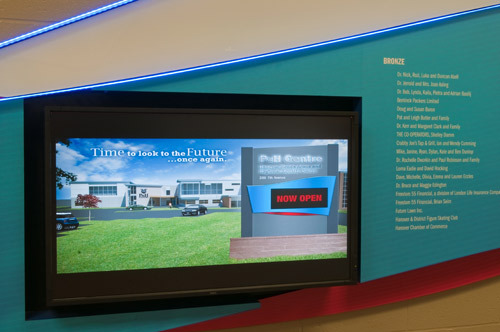 The Presbyterian Healthcare Foundation of Albuquerque, New Mexico, selected Planned Legacy to design an integrated recognition display that would elevate the Foundation’s message and achievements to a new level of excitement and discovery. For the architectural component, Planned Legacy captured the colors and textures of the surrounding landscape and Sandia Mountains, blending natural hues with indirect lighting to create an inspiring panorama. Glass panels, photomurals and historic images celebrate donors, honor early Hospital leaders and promote the Foundation’s achievements and activities. Complementing the architectural display is an interactive multimedia presentation, viewable on a 40″ touch-enabled LCD screen. The presentation showcases the Foundation, its leadership and vision, and visitors can search donor names and profiles using an alphabetized index, watch video clips of noteworthy individuals and events, and even make a contribution to the Foundation by using a secure credit card swipe that transmits information instantly to the Foundation office. 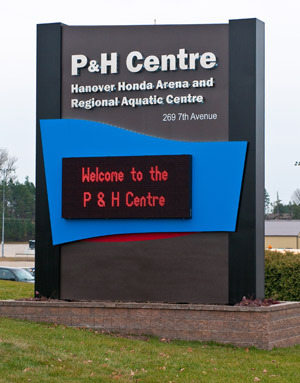 The Town of Hanover contracted Planned Legacy to design and fabricate a donor recognition project for the P & H CENTRE: Home of the Hanover Honda Arena & Regional Aquatic Centre, sports and recreation facility. 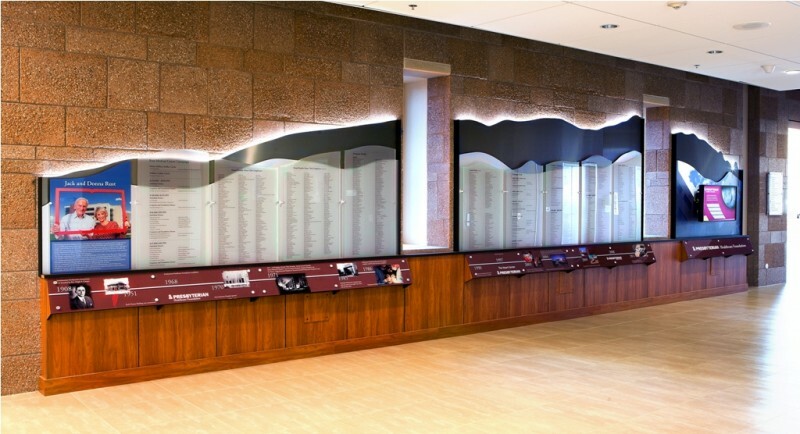 The donor recognition wall is the central feature in entry lobby visible from the first and second floors. 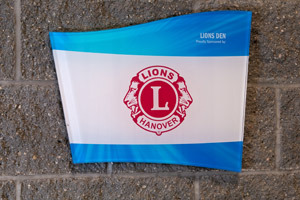 It is designed to infuse the space with a sense of athletic energy and forward movement, representing not only the physical action, strength and spirit of community sports and recreation, but also the Hanover community working together towards their visions for the future of the complex – which would not exist without the support of donors. Designed to be evocative without being literal, the 25’ wide by 6’ high wall used fluid lines, subtle graphic print imagery and LED edge lighting to represent the overall spirit of the complex through tangible elements such as water and ice to more abstract qualities such as community support, a rich history, team spirit and human endurance. The look and feel was created by printing an “energy explosion” graphic on acrylic. Vibrant colors and vectors provide a sense of energy and vitality, and different sized fonts for giving categories add to the perception of depth. The smoothness of the design is intended to act as a foil, contrasting the rough textured block which fills much of the space. CNC technology provided clean and crisp lines. 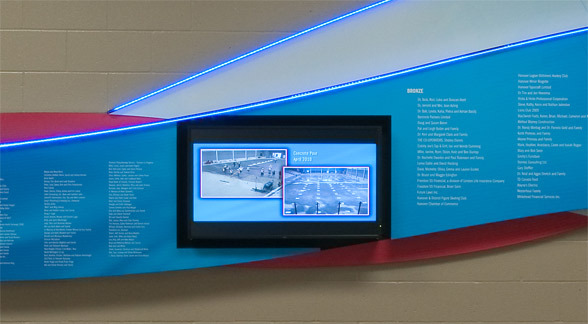 Dynamic content featured on the display includes history, information about the new facilities, and activity schedules which will help eliminate paper bulletins. Future gifts to the facility, including seat sponsorships in the new arena, will also be acknowledged through the multimedia presentation. Over 71 individual recognition plaques are spread throughout the facility, recognizing key partnerships for sponsored areas. The tiered acrylic plaques compliment the look and feel of the main wall with donor names and institutional logos applied in a monochromatic palate with vinyl graphics. 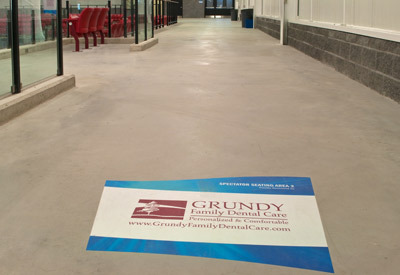 For the named areas in the arena proper, floor decals were incorporated, as the client wanted to avoid commercializing the visual space surrounding the ice rink. The exterior signage follows the same inspiring principles used for the recognition wall. A monochromatic red LED was chosen for the display. Considerations were made to resurface and reuse the existing base for the installation. For more detailed information on the Town of Hanover donor recognition project please call Planned Legacy Toll Free at 1.866.882.3580 or e-mail solutions@plannedlegacy.com. Recently, Benefis Health System completed construction of its new Patients Tower, a seven story, $85 million project that features some of the most advanced diagnostic and treatment facilities in the US Midwest. An important element of the project was the requirement for a series of recognition and historical displays that would match the innovation and architecture of the new hospital. The project involved the design, fabrication and installation of three unique integrated displays, each incorporating interactive multimedia presentations along with architectural design that embraced the local geography, while also communicating the messages of the Benefis organization the respective display represented. As well, when the multimedia presentation screen has been idle for a period of time a screen saver engages that can show a scrolling list of donors, Mission Statement or other call to action. Headquartered in Great Falls, Montana, Benefis Health System serves over 15 counties and more than 225,000 residents. Benefis is also the largest non-governmental employer in the greater Great Falls area with over 2,300 employees. For more detailed information on the Benefis Health System donor recognition project please call Planned Legacy Toll Free at 1.866.882.3580 or e-mail solutions@plannedlegacy.com.